Justin Trudeau charms India Inc into investing $1 billion in Canada, creating 5,000 jobs. Canadian Prime Minister Justin Trudeau, who is the country on a week-long trip with his wife and three kids, spent Tuesday morning in Mumbai meeting with titans of business and finance at the Taj Mahal Palace Hotel. After providing picture-perfect optics at Taj Mahal in Agra, Sabarmati Ashram in Ahmedabad and Akshardham Temple in Gandhinagar, it was all business for the Canadian leader. After a fruitful session with the financial bigwigs, Trudeau said corporate India has committed USD 1 billion worth of investments in his country, which will create over 5,000 jobs. Trudeau met with industry leaders including Tata Group chairman N Chandrasekaran; Birla Group chairman Kumar Mangalam Birla; Mahindra group chief Anand Mahindra; Salil Parikh of Infosys, and Cyrus Mistry of the Pallonjee Mistry group, among others. The Canadian premier also had a 90-minute roundtable with women business leaders including ICICI Bank chief Chanda Kochhar and Swati Piramal of the Piramal Group, among others at the iconic Taj Mahal hotel. “There are tremendous connections between Canada and India, whether it is natural resources or tech sector like IT, creativity, pharmaceutical... there are huge compatibilities and complementarities between our nations. So much so that we are able to announce over 5,000 new jobs in Canada and over USD 1 billion of (Indian) investment in Canada,” Trudeau said at the Canada-India Business Forum. “It has really been a win-win morning,” Trudeau remarked. On the need for empowering women in all walks of life, he rued that India has only 26 per cent women participation in the world of business, saying this was one of the lowest globally. “Business leaders should take the time to listen to women and empower them because empowering women leads to good business and helps the community,” Trudeau said. 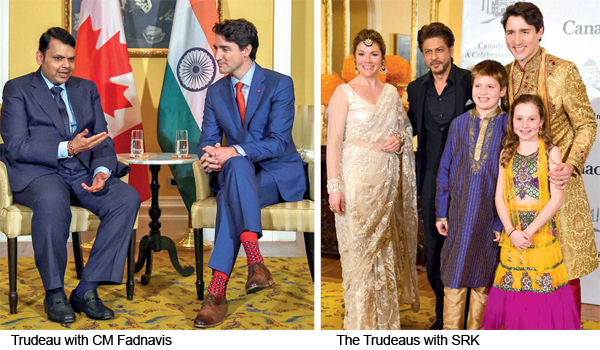 Trudeau’s evening ended with engaging with the who’s who of Bollywood. Trudeau, along with wife Sophie Gregoire, daughter Ella-Grace and son Xavier James met superstar Shah Rukh Khan at an event.